The Communist Party USA is out to recruit the religious. Not content with workers, "people of color", youth, greenies, gays and the generally disgruntled, the reds are coming after Christians, Jews, Buddhists and Muslims. The Communist Party USA has re-founded its Religion Commission as it seeks to bring more churches and "people of faith" into the "progressive" fold. Of course, the communists don't seek to learn from the religious. They seek to "guide" them. It must be a task of Communists who are active in faith communities to bring to people an awareness of the progressive values and potential inherent in their traditions and to lead them to turn that awareness into action that will challenge both the members and leaders of their religious communities and the larger society. The party has a fine record of working with "Christians". Our Party has a history of working with religious activists and communities of faith. Many of our members are people who are active in religious communities, or have connections with faith-based groups... The Rev. Arnold Johnson, a Methodist minister, joined the Communist Party while he was in jail during the Harlan County, Kentucky coal miners' strike, and he went on to be an outstanding leader of the Party. Paul Robeson never lost touch with his roots in the African Methodist Episcopal Zion Church. His work combined an appreciation of scientific socialism with the spiritual dimensions of the Black Church. Robeson's funeral was held at the AME Church where his brother was the pastor. Among his pallbearers was Gil Green, a longtime leader of the CPUSA. Because of his public role, he was not in a position to publicly acknowledge his Party membership. But Robeson was a leader and Party supporter, and both a Communist and a Christian for all of his adult life, and in the best senses of both. The party doesn't mind if you worship Jesus, Buddha, Muhammad, just as long as you care about "social justice". We must take a conscious and welcoming approach to recruiting people of faith into our Party. To that end we are working on a pamphlet which will introduce our Party and its program to progressive religious people, and invite them to join. The strong progressive traditions within many faith communities in the US offer a promising basis for mobilizing not just individuals but substantial communities and institutions of faith in support of social and economic justice. Therefore the Commission should also serve as a means of assisting the work of religious comrades within their respective religious bodies and organizations. The Communist Party USA has asked two righteous party members to minister to their religious flock. 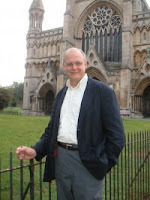 Tim Yeager is is a member of Grace Church in Oak Park, Illinois, where he serves as assistant organist. Tim is the Chair of the Peace & Justice Committee of the Diocese of Chicago and has served in the national leadership of the Episcopal Peace Fellowship. He is concerned that the Church finds and uses its prophetic voice to advocate for a more just and peaceful socioeconomic order, and feels that there has never been a greater need for all people of good will to join together in the struggle against poverty, violence and fear. Tim is a long time Communist Party USA member and works as Financial Secretary/Treasurer of the National Organization of Legal Services Workers, United Auto Workers, Local Union 2320, which represents nearly 4,000 lawyers, support staff, social workers and other employees working in legal and human services agencies across the country. Resolved, that the 172nd Convention of the Diocese of Chicago call upon the President of the United States and Congress to press the State of Israel to end the blockade of the Gaza Strip thereby permitting free and uninhibited access for all humanitarian assistance, a return to normalized trade, and the lifting of the ban on building and educational materials. Tim serves as the Communist Party USA Religion Commission Chairperson. The Rev. Pierre L. Williams received his Bachelor of Arts degree from Eckerd College in St. Petersburg, and his Master of Divinity Degree from Virginia Union University in Richmond, Virginia. After being awarded the Master of Divinity degree, he also completed pastoral residency at Johns-Hopkins Hospital located in Baltimore, Maryland. He currently serves as Staff Chaplain at Harbor Hospital, Baltimore. He is an ordained minister in the African Methodist Episcopal Zion Church. Pierre Williams, as have we all, has been tempted. He has succumbed. Many years ago, in his wayward youth, Pierre L. Williams, 52, of Baltimore, Maryland, pled guilty to defrauding the United States Department of Education by using false social security numbers in order to secure $29,500 in guaranteed student loans. Pierre pled guilty to one count of Student Assistance Fraud and was sentenced to Caesar's punishment, on February 8, 2000. Pierre was pursuing a master's degree in divinity at the Wesley Theological Seminary at the time of the offense and in the fall of 1995, submitting an application for financial aid using his true social security number. Because he had previously defaulted on his college student loans in the 1980's, his financial aid application was denied. For the following academic year, he submitted a second financial aid application using a false social security number. The Office of Financial Assistance at Wesley Theological Seminary approved this application and processed the loans, In subsequent applications, Pierre used two other social security numbers, both false, to secure additional loans. When officials at Wesley learned of the discrepancies and confronted the defendant, he initially denied having committed the fraud, but he eventually admitted his guilt in statements made to federal investigators and administrators at Wesley. Pierre has sought atonement for his lapse through good works. He is an active and contributing member of Baltimore United for Peace and Justice and the Phillip Berrigan Memorial Chapter of Veterans for Peace. In 2008, Pierre joined his party comrade Tim Wheeler in campaigning in South Carolina for his Christian brother Barack Obama. Pierre serves as Secretary of the Communist Party USA Religion Commission. Some cynics may feel that the Communist Party USA is merely exploiting religion as a means of furthering its revolutionary agenda. I ask the hard hearted among my readers to cast such dark thoughts aside and accept that our communist brothers are as committed today, to religious freedom, tolerance and the exercise of conscience, as they have been in the past. Appears to be a (slight) variation of SEIU's tactic of finding sympathetic (gullible) religious figures and using them as props in union organizing drives (called "corporate campaigns" or "comprehensive campaigns") that are disguised to look like a community / social justice drive against a targeted company. It makes sense to me, Jesus was more a communist than he was a capitalist. But Christians don't really follow Jesus' teachings do they? Jerry, I dont think you follow Jesus to closely. The bible and Jesus talk about work constantly and warn against idleness. The bible nevers says to steal from others. Communism is legalized theft and breeds poor quality of work and laziness! I'm pretty sure Jesus would be a capitalist. Clever to rope 'social justice' as a means to steal power. Reminds me a lot of the poeple of Austria and their hopes and good intentions ..... which then quickly became just one huge bad dream. And if it worked, they would all be thrown under the bus when they were no longer useful. Fools all. "It is easiest to begin with the Catechism of the Catholic Church, which enunciates the principle of subsidiarity in the context of man's social nature. When the principle of subsidiarity is ignored, governments often overstep their bounds in managing matters best handled on a more local or individual level. Typically this decreases economy, efficiency, liberty and the personal character of the social order. "It is not right for either the citizen or the family to be absorbed by the state; it is proper that the individual and the family should be permitted to retain their freedom of action, so far as this is possible without jeopardizing the common good." He also condemned such taxation that amounts to public interference with "the productive activity of the multitude [which] can be stimulated by the hope of acquiring some property in land." ". . . [Justice] does forbid anyone to take from another what is his and, in the name of a certain absurd equality, to seize forcibly the property of others". "It is a fundamental principle of social philosophy, fixed and unchangeable, that one should not withdraw from individuals and commit to the community what they [individuals] can accomplish by their own enterprise and industry." Trevor...I emailed Harbor Hospital in Baltimore about this horrifying and bizarre story and they have confirmed that Pierre L. Williams is no longer a member of their staff in any capacity. Thanks for all that you do for freedom.